1. Press and release the Volume Up button, then Press and release Volume Down button. 2. Now, press and hold the Power switch and leave when the Apple logo appears. Keep in mind to do these three steps in quick succession. 1. Press Power switch on the right side plus the Volume down button on the left side together. 2. Now, wait for the Apple logo and leave. Then wait for the startup sequence. 3. Similarly put in the passcode when prompted. 1. Press the Home button and the Power switch simultaneously. 2. Wait for the Apple logo to appear and leave the buttons. 3. The phone will go into the startup sequence. 4. After sometime enter your passcode when prompted. 1. First connect your iPhone to your PC, through an USB cable and launch the latest version of iTunes. For iPhone 6/6s/SE and below: Press and hold Home button and the Lock button together. 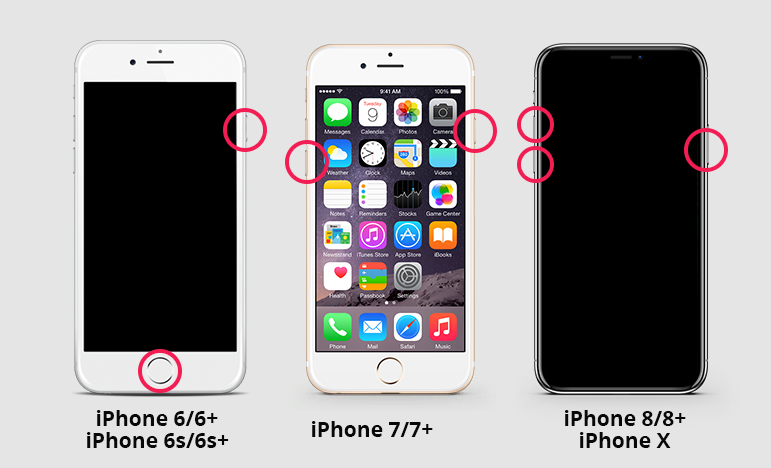 Leave the Lock button only and hold the Home button after 8 secs. If you see nothing on the screen, you have successfully entered DFU mode. If not, you may see the Apple logo if the Lock button is pressed for too long. For iPhone 7/7 Plus: Press and hold the Side button and Volume Down button simultaneously. Leave the Side button and hold the Volume Down button after 8 secs. If you don’t see anything you have done it the right way, if not repeat the steps and make sure you don’t hold the Side button for too long. 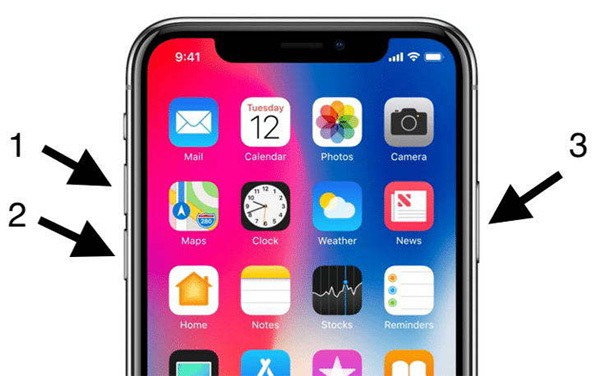 ForiPhone 8/8 Plus/X/XS:Quickly hold and release the Volume Up button. Now, similarly quickly hold and release the Volume Down button. Press the Side button now and you will observe a black screen. Now, press the Side button along with the Volume Down button. Leave the Side button while still pressing the Volume Down button after 5 secs. If you don’t see anything on the screen, you have DFU mode or else repeat the steps again. 3. Now, after you successfully enter DFU mode while connecting your iPhone to iTunes, you will see a prompt in iTunes asking for Update or Restore. 4. Select Restore and wait for iTunes to erase all content on your device and restore to latest official iOS. 5. After this, your iPhone will restart, and now you should choose “Slide to set up” to proceed and follow the instructions as prompted. And you are done! Keep in mind, while using iTunes to update iOS, you will experience data loss. So, back up beforehand if necessary! 1. Download, install and launch the Tenorshare ReiBoot software on your computer. 2. Now, connect your iPhone to your personal computer using the original lightning cable. 3. Choose the “Fix all iOS Stuck” option from the list and follow the wizard. 4. After the detection, click “Download” to download the firmware to your specified path. 5. Now, tap “Start Repair” to begin the repairing process. This is how to fix iOS 12/12.1 update stuck on Apple logo using Tenorshare ReiBoot. So, these are 3 effective ways if you have your iPhone stuck on Apple logo after update iOS 12 . Follow these steps carefully and choose the one according to your requirements. 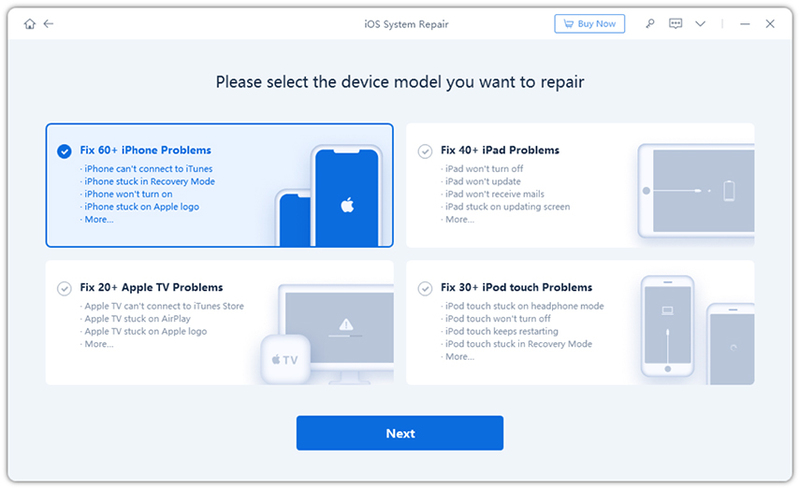 In the end, there can be a lot of reasons for getting stuck on Apple logo like a faulty installation, a bricked phone, unsupported device, compatibility issues, storage problems etc. If you suspect a hardware crash, it is recommended that you contact Apple right away. Other than that, if it is a mere software issue, you can always fix it on your own. If you ask our opinion, go for Tenorshare ReiBoot in the first place as it will save you from a lot of hassles and also provide you with stellar advantages over other methods, the most important being no data loss! We highly recommend this software for all your iOS stuck issues.